Pensacola Florida Wedding Photographers- A husband and wife team specializing in luxury fine-art wedding photography. Your Wedding … Our Passion! We believe in delivering a personalized service and an attention to detail that ensures your entire experience is as incredible as your imagery. Contact us today and learn more about our wedding photography services. We would love for you to tell us about your wedding day over a cup of coffee! Learn what makes an Adam Cotton Photography Wedding truly special! We take pride in our engaged couples and the beautiful imagery we create for them! It truly inspires us to meet new people and create art. We believe so much in true love. As a husband and wife team, we get to enjoy those breathtaking moments that inspire us. Wedding ideas and tips; engagement ideas and tips; for brides and grooms alike... and perhaps just a little bit of beautiful photography thrown in for good measure! I knew we had to get a shot of that dress in that room… they just complimented each other so well! The front and back barn doors we definitely used to our advantage, and the more fitted lace gown paired with a cathedral veil was the icing on the cake for those shots. If you’re planning on throwing your bouquet, make sure it’s not too heavy and easy to throw. The last thing you want to happen is one of your “single ladies” getting clocked in the head by a monsterous set of flowers! Let’s face it… aside from you and your future husband, it’s probably the star of the celebration! Just when you think that it couldn’t get any more sentimental, K’s brother officiated…which we thought was awesome! Oh, did I mention the groom’s cake was the Death Star?! Aaron also had Millennium Falcon cuff links, which really sent Adam on a nerd high! Needless to say, I had tears rolling down my cheeks, snot falling out of my nose, and no tissues in my pockets all while trying to hold a light steady while Adam was capturing this very special dance! Some photographers feel like they want to be one of the guests, or even worse, they start schmoozing and networking with everyone else at the wedding. Wedding planning can be daunting and frustrating, but it can also be extremely rewarding. And even if you hire a professional wedding planner, you will still need a starting point. Speaking of the cake, Lacy had told me that she likes "weird" flavored foods, so it should come to no surprise when I tell you her cake flavors were lavender with lemon curd... and boy was it yummy! I love cakes that are out of the ordinary! We truly believe weddings are some of the greatest events and photography is one of the best ways to experience them. We look forward to photographing memories for you to look back on for years to come! When you desire professional photographers that strive to capture beautiful moments, and create breathtaking images, we are your wedding photography team. "Inspire us... and we will create something beautiful!" 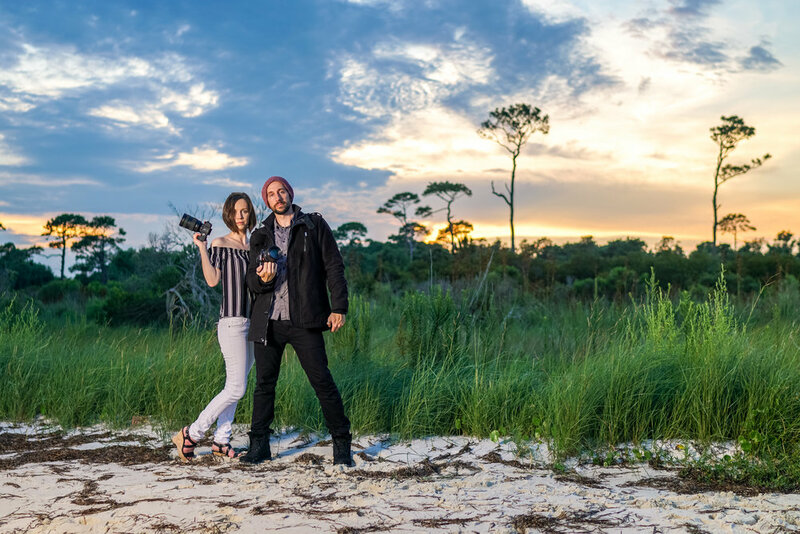 ﻿We Shoot along the Gulf Coast including Pensacola, FL; Destin, FL; Panama City, FL; Ft. Walton Beach, and have done destination weddings in Orlando, FL; Mobile, AL; Dothan, AL; Baltimore, MD; Annapolis, MD; Washington D.C.; Albany, GA; New Orleans, LA; and Tampa, FL.